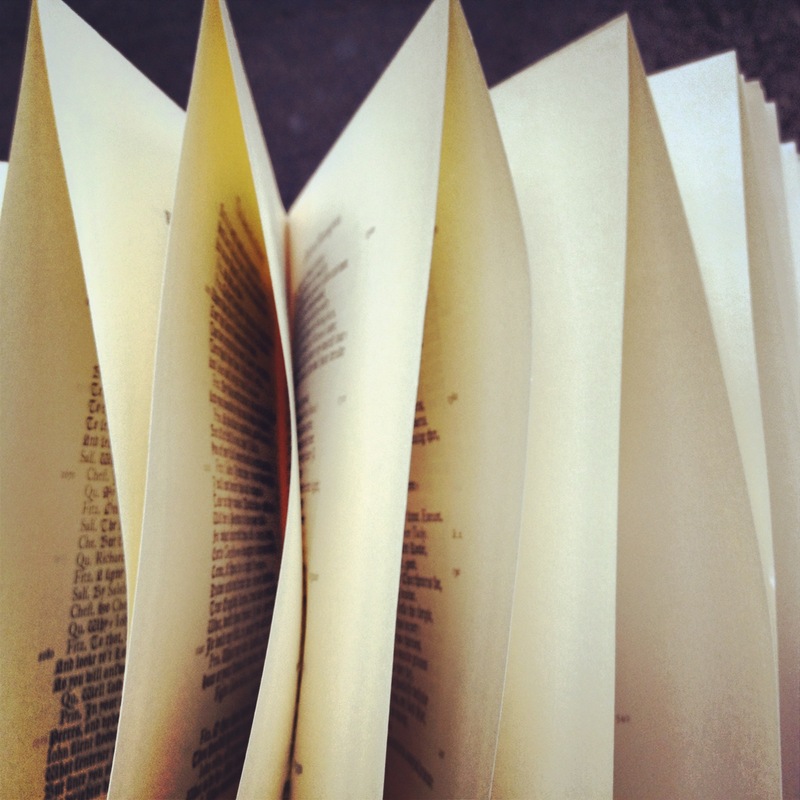 Have you ever had to cut the pages of an old book in order to read it? It’s like venturing into virgin territory, a frontier. It never fails to thrill. I let the books sit at home while I used the Folger’s superb collection to read The Troublesome Raigne of John, King of England and Patient Grissill (and other non-dramatic things). Until today yesterday. Today Yesterday I decided to try something new and I CUT THE PAGES. The process was strange – I was cutting against the paper’s chains with a tool made for slashing cardboard. My instinct was to slice as with a knife, but I made better cuts by using the same upward pressure as a letter opener. As I separated pages I noticed some things about the printing process which are probably interesting to very few. In Downfall, K1 and L2 were already cut, implying they were printed on a half sheet. (Or, just as likely, two sets printed per sheet, cut in-house, then bound.) 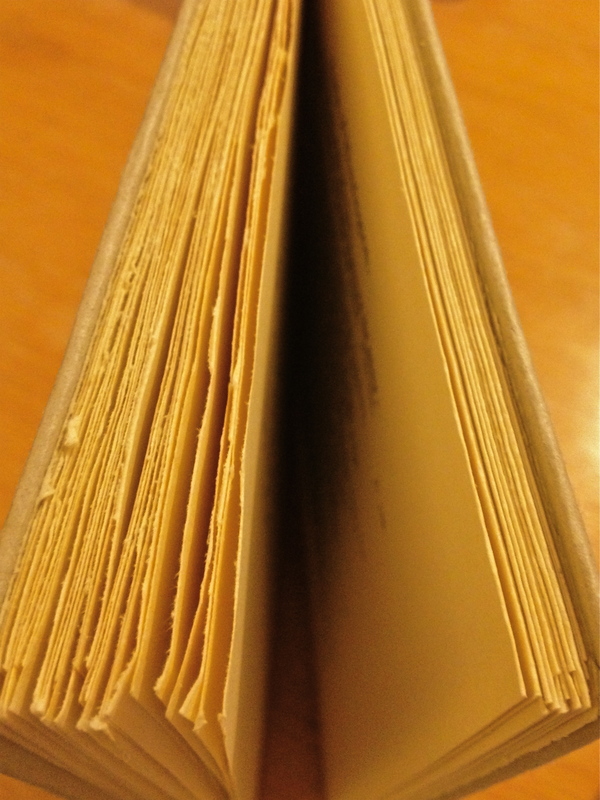 Curiously in Death, the last two pages of the play (M1-2) needed to be cut on the vertical edge. I’m not quite sure what to make of that, but then, it isn’t my job. My job is to get back to reading. And lucky me: they’re both in black letter. Just for fun, a photo near the half-cut point. Such a shame to see those smooth lines get all roughed up. nb I didn’t really think it was like venturing into virgin territory, but I was so amused that Ms Gulland’s blog was the top result for a Google search I felt I must include it here. Previous A Proverb of Encouragement. Next A 4 minute miler and a 90 minute Maccers. Truth told, Sandra, if the books weren’t for work, and if it had been packaged like the book on your blog, I would have felt more excited about the whole thing. As it happened, I was a little worried about ruining two books that are a few years out of print. Did you end up cutting those pages with the enclosed tool? After my adventure I wonder if anything less than razor sharp would do the job.